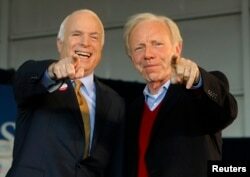 FILE - Sen. John McCain, R-Ariz., speaks to reporters on Capitol Hill in Washington. “In the thirty-three years we shared together, he raised me, taught me, corrected me, comforted me, encouraged me, and supported me in all things. He loved me, and I loved him. He taught me how to live. His love and his care, ever present, always unfailing, took me from a girl to a woman — and he showed me what it is to be a man,” she wrote. 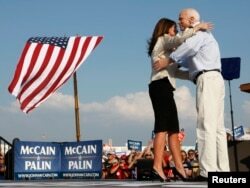 US Republican presidential candidate Senator John McCain (R-AZ) and his running mate Alaska Governor Sarah Palin hug during a campaign stop in O'Fallon, Missouri August 31, 2008.